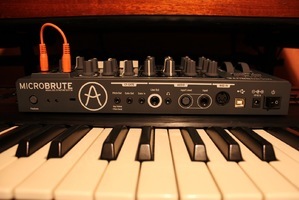 MicroBrute, Analog Synth from Arturia in the MicroBrute series. Less than two years after the introduction of the MiniBrute, the MicroBrute has set out to conquer the electronic music world with even more aggressive price and dimensions. But how far will it go? All of them were outsmarted by Arturia, and the most reactionary took more than a year to respond. As a consequence, the selection of budget-priced mono analog synths is larger every day, something we certainly won't complain about. But far from resting on their laurels, the designers at Arturia ─ still under the guidance of Yves Usson ─ have been working hard for a year. The result is a new warning shot at the electronic music market, this time with a price tag closer to that of a software, which ought to break the last opponents of real instruments played with fingers. 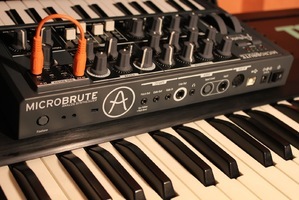 And today the MicroBrute is already in the stores! 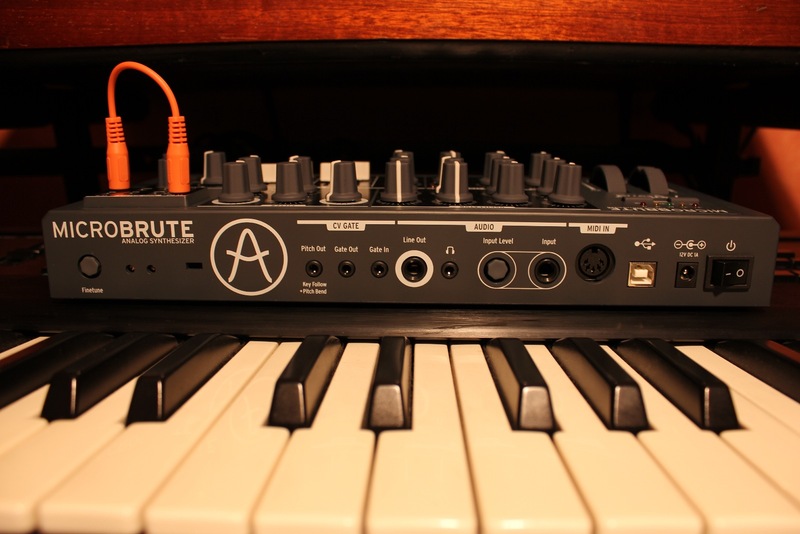 What is more compact than the MiniBrute? 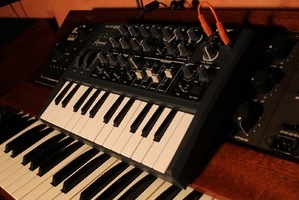 The MicroBrute, of course! It occupies half the space of its mini-sibling. The reduced size is achieved thanks to the two-octave mini-key keyboard, 12.5in (32cm) wide and 8.6in (22cm) deep. It now fits in a laptop sleeve rather than in a backpack. The massive aluminum shell has turned into a rigid molded plastic one, only the bottom side is made out of metal, which limits the weight to 2kg. Nevertheless it gives a very sturdy impression. The knobs are firm, the envelope faders feel nice and the tiny selectors are sufficiently straightforward, despite the shaft being a bit loose. 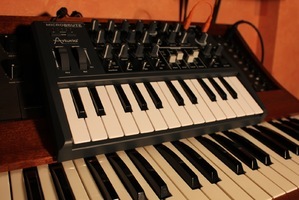 The mini-keyboard is OK, with an even resistance for such type of keyboard: it transmits the velocity externally but the MicroBrute does not respond to it internally. All controls are directly accessible, there is no digital control except for the tempo. To amuse ourselves, we have 19 pots (one of which has a center detent for the bipolar modulation of the filter envelope), one 8-position rotary knob, four faders, six switches (with two or three positions), and two octave shift buttons (-2 -1 0 +1 +2). More than enough, I'd say! 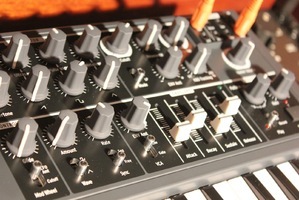 The controls are logically distributed in two rows, which makes operation easier: oscillator and filter on top, LFO, envelope and sequencer at the bottom. The volume knob feeds the audio output with a level of +4dB. Pitch and modulation wheels are also included, just as small as on the MiniBrute, and they are placed right above the keyboard, to contribute to the overall compactness. 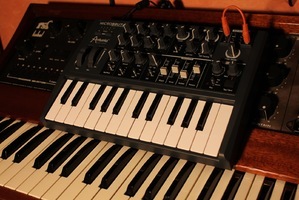 A difference with regard to the MiniBrute is that there is a modulation matrix with eight mini-jacks on the top right corner. The synth comes with two patch cables, which we will come to later. The connections take up the whole rear panel. 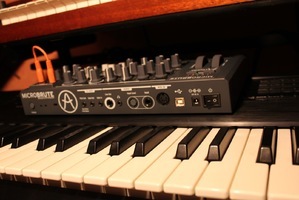 Power switch, external PSU connector, USB (MIDI input/output only, since the Brute needs more power than USB can supply), MIDI input, 1/4" jack input with dedicated gain control (which allows for more gain than on the MiniBrute), mini-jack headphones output, 1/4" jack output, mini-jack Gate input, mini-jack Gate output, mini-jack Pitch + Bend output, Kensington security slot, and a general tuning pot. Those of you who know how to count have surely noticed that there are two pots on the rear of the MicroBrute; Arturia had the excellent idea of making them fully retractable by simply pressing them, which protects them from unintentional bumps and modifications, well done! The most keen among you will have surely noticed as well that there are two small holes between the tuning knob and the Kensington slot: they allow us to calibrate the VCO (starting frequency + slope in Volts/octave). 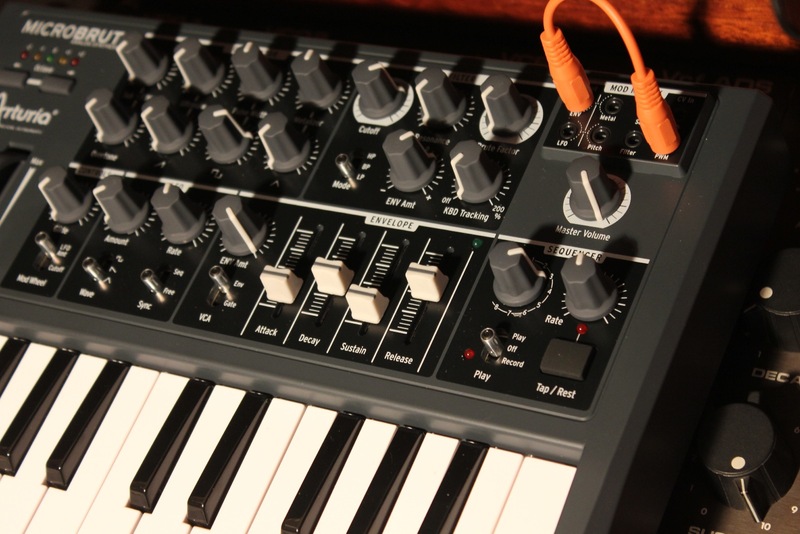 On the other hand, it displays the same defect as the MiniBrute, namely that it does not have any pedal inputs. Right from the start we can recognize the original sound of the MiniBrute. The filiation is obvious. Using the exact same settings we get the exact same sounds (except for the MiniBrute features that aren't available on the MicroBrute, obviously). Hence, it is a pleasure to find the unique oscillator that allows us to mix and modulate multiple waves, opening up wide experimental territories. As soon as we increase the waveform volume, the filter saturates and the sound turns dirtier. The filter resonates without restrains once the resonance knob is three quarters up, regardless of the mode. It wails as loud as if the oscillator of a MS20 was stuck underneath the cover of a CS80. 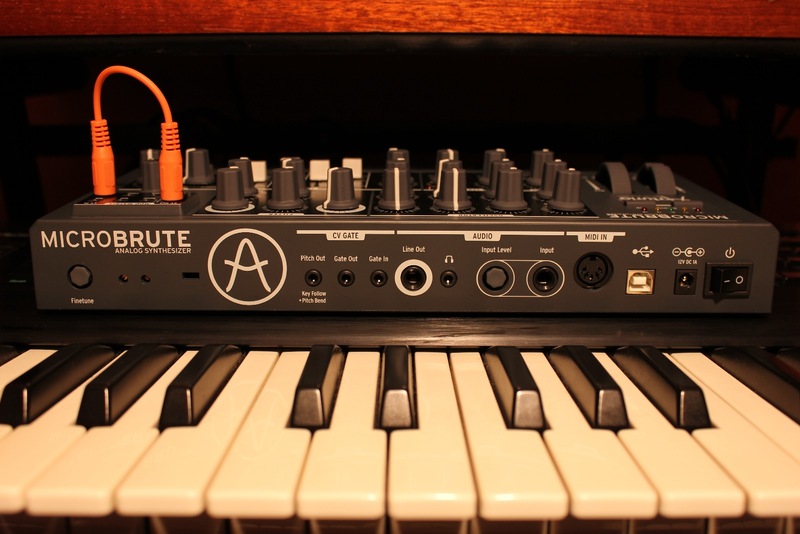 With the Brute factor we can create distortions ranging from simple global warming to an analog natural catastrophe. The envelope roars very loud too! A nice surprise: the Sub has evolved so we can now change its key from the octave to the fifth continuously. A not-so-nice surprise: there's no noise generator, darn! With the modulation matrix and the sequencer you are in for a lot of fun: for example, if we choose a square LFO synced to the sequencer and we assign it to the Sub via the matrix, we can now alternate between the Sub to the octave or the fifth in sync with the sequencer (and we must admit we overdid it in the examples, but it allowed us to modify the sound with both hands). By modifying the speed of the synced LFO we change the time division and hence the modulation frequency with amazing results. Keeping up with our delusions, we assigned the LFO's triangle wave to the PWM and even to the triangle's Metalizer. It only makes you want to have multiple cables to modulate several parameters as the same time. Due to the absence of preset memories and the possibility of modifying parameters via MIDI CC (the MicroBrute being a pure analog synth, apart from the LFO, the sequencer and the MIDI section), As with the MiniBrute, Arturia has created preset sheets, like in the good ol' days. The Micro comes with ten preset sheets and five empty ones. The unique analog voice of the MicroBrute is the producet of one single VCO, a real one. You have to wait a couple of minutes before Dr. Usson's oven reaches cooking temperature (52°C) to make the VCO simmer stably. Like on the MiniBrute, the oscillator is truly unique: firstly because there's only one, and secondly because it can mix very finely all its waveforms (each with its own volume) but also modulate them (each with a parameter that allows us to change the harmonic content). 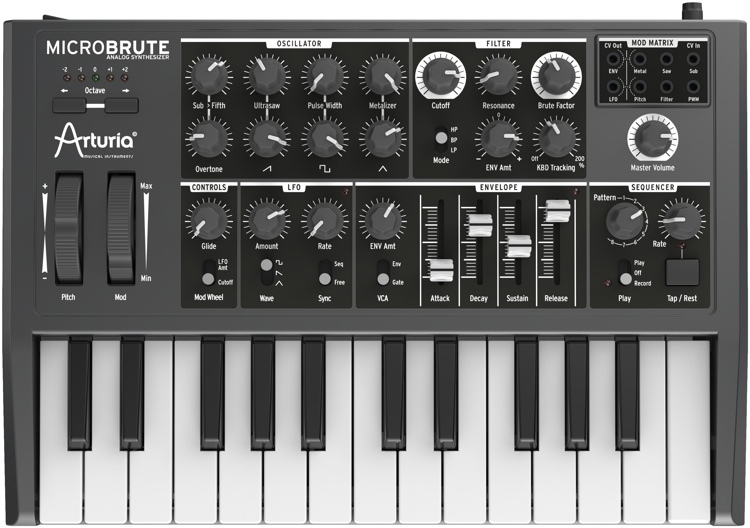 The MicroBrute's VCF is identical to the one on the MiniBrute. And it is greatly responsible for the originality of the sound. 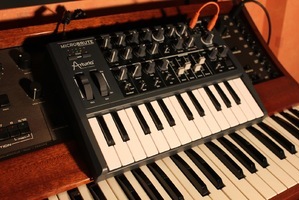 Rather than adopting the Moog-like ladder filter that can be found on most analog synths, Arturia used a Steiner Parker filter. It's a two-pole multimode resonant filter with low-pass, bandpass and high-pass modes (no band-stop this time!). The cut-off frequency varies from 20 Hz to 18 kHz. With a cut-off set between 350 Hz and 8 kHz, the resonance can put the filter into an outrageous self-oscillation without collapsing the other frequencies ─ it must be said that it was tamed by Yves, aka Master Of The Yuniverse (which is how he is known in certain circles). The cut-off frequency can be directly modulated by the key follow (0% to 200%), the ADSR envelope (bipolar modulation) and the modulation wheel. The VCA is obviously at the top of the processing chain. And here is where the famous Brute Factor feedback loop can be found, right between the VCA output and the VCF input. Depending on the Brute Factor settings for the filter's cut-off frequency and resonance, the results are varied: from simple saturations in the low end to the most harrowing distortions. Fortunately the audio level is partially compensated automatically. The envelope affects the VCA directly without the possibility of adjusting the intensity. Only in Gate mode we can avoid this problem by keeping the VCA 100% open, but pay attention to the clicks. 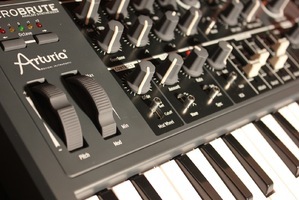 To modulate the signal the MicroBrute offers Glide (adjustable portamento). The LFO and envelope can be reassigned via the modulation matrix. The LFO is pre-assigned to the pitch. By default it operates in cycle mode but it can be switched to sync mode via software (see below). Its action is modifiable directly or via the wheel. The frequency varies between 0.1 and 200 Hz in cycle mode. In sync mode the frequency is synced to the sequencer's clock and, in this case, the frequency parameter allows us to modify the time division. The available waveforms are: square, sawtooth and triangle. There's no random waveform (no noise generator) nor delay parameter. The envelope is ADSR; it is fast and punchy. The attack and decay vary from 2.5ms to 2.5 seconds, while the release goes from 5ms to 5 seconds. The envelope is permanently assigned to the VCA, except in Gate mode, where it is deactivated. It is also pre-assigned to the triangle's Metalizer. 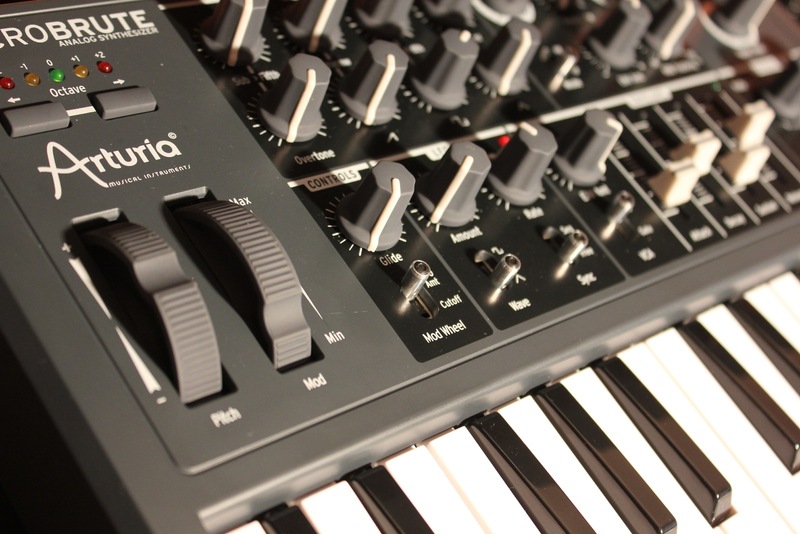 It's not surprising that the MicroBrute offers a small modulation matrix (three sources and six destinations). The sources are key follow (CV output at 1 Volt/octave, located on the rear), the LFO and the envelope (CV outputs in front). When we connect a cable to a source we break the pre-assigned routing (LFO to pitch / envelope to Metalizer). The same applies to the destinations: Metalizer, Ultrasaw, Sub (mixed octave/fifth), PWM, pitch and filter. 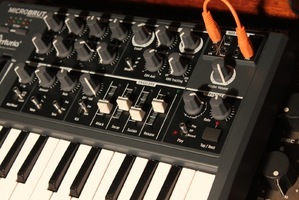 A well thought-out way to avoid the limited number of direct modulations, a point where the MiniBrute was much beefier. In contrast, the VCA is not included as a destination — pity! As we mentioned before, the most handy amongst you will not take long to make your own cables to assign one source to several destinations, creating six-legged patch insects. We can also use this matrix to connect the MicroBrute to an analog modular synth in order to use the LFO or the envelope as sources, or to manage the six targeted parameters from the modular synth, thus avoiding the rarity of the internal LFO and envelopes! While the MiniBrute features an arpeggiator, the MicroBrute has a note sequencer that can be programmed step by step. 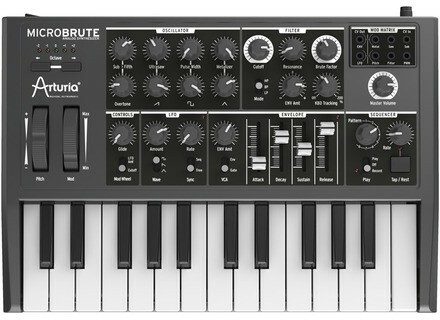 According to the manufacturer, it is only a matter of the MiniBrute evolving rapidly in that sense via OS updates. There are eight rewritable sequences that can be saved in the memory. Every sequence has 64 steps, each of which can be a whole note played on the keyboard or a silence (Tap/Rest button). Sequences that are already saved in the memory can't be edited, we need to restart from scratch, which is a pity. As soon as we launch the sequence, the keyboard triggers and transposes it in real time. 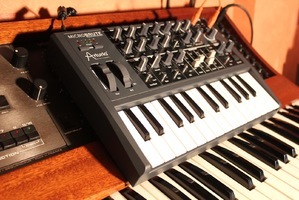 The notes can be transmitted via CV/Gate (which allows us to control an external analog synth) or USB (for the MIDI Out). 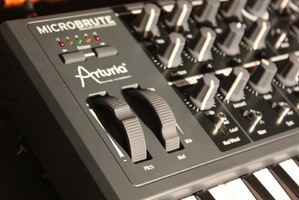 The free Arturia MicroBrute Connection software included (we tested OS 0.9b) allows us to choose the playback mode (Hold, Retrigger, Next Step, Gate) and the time division in relation to an external clock. The "Step On" option makes the sequence go forward, be it via the Gate input or the Tap Tempo button. Nice. Sending and receiving sequences (in batch or individual ones) is foreseen... it would be great to be able to edit them as well! It is also by means of the software that we can modify certain internal parameters that aren't directly accessible on the MicroBrute: LFO and envelope retriggering mode, note priority (high, low, last). 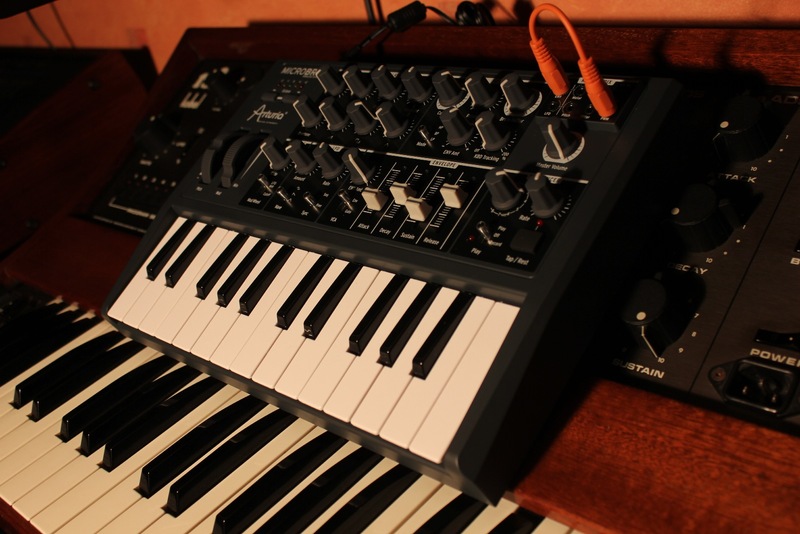 Yves Usson gave us the following tip, for those who plan to use a MicroBrute and a MiniBrute simultaneously: by setting note priority to "high" and "low" respectively for each synth, we can play in duophonic mode. Without pushing our depravity too far, I would love to have both at hand… two VCOs, two VCFs, an arpeggiator, a sequencer. 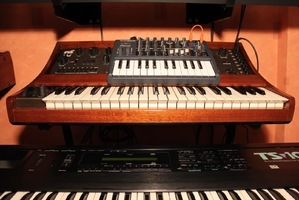 They complement each other nicely, yum!… It is also via the software that we select the MIDI transmission and reception channels and the emitted velocity response curve of the keyboard (linear, logarithmic exponential). Who would've said two years ago that we would be able to buy a new, modern, original, transportable, fully equipped analog synth for €500? 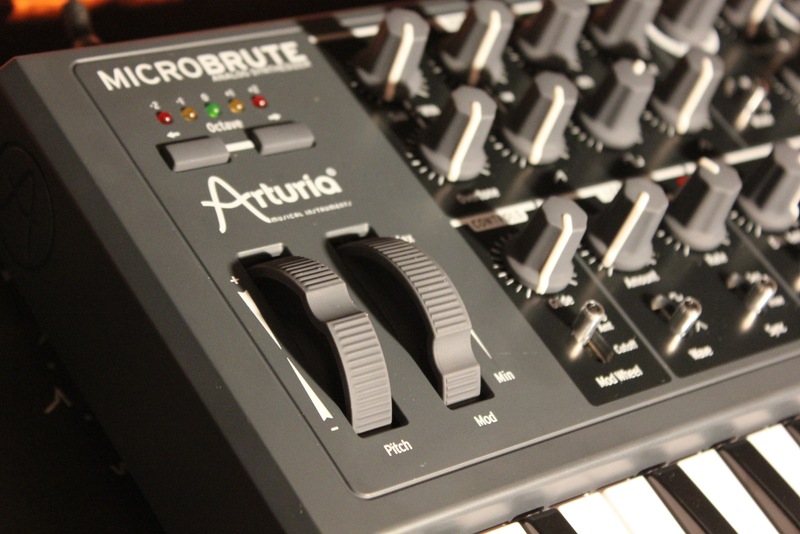 Today you can get a MicroBrute for almost half that — it's unbelievable! 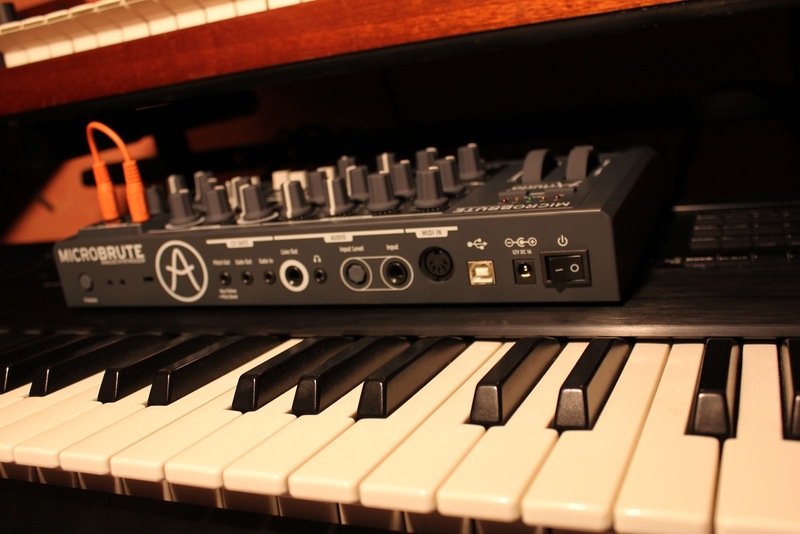 This modest investment ─ the same you could spend on a software ─ allows you to have an analog sound with a strong character, direct controls to trigger/squeeze sound in real-time and a seamless integration with different synth generations. It has its downsides but no real deal-breakers, and those having big fingers can always opt for a separate keyboard controller. Putting that aside, we have here a full-fledged synth that ought to bring down the last barriers and seduce die-hard opponents of real electronic instruments. 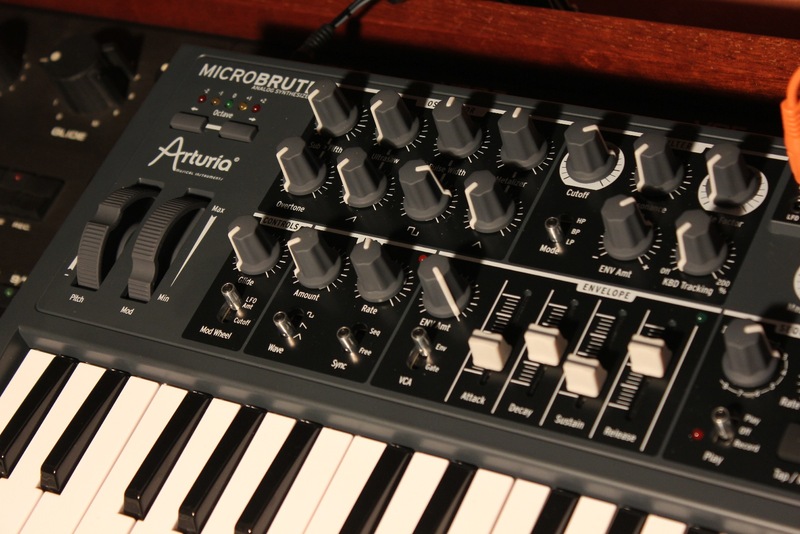 And for those who already own a MiniBrute, the Micro is wide open and offers a lending hand. 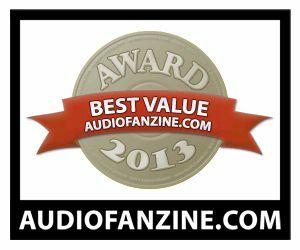 It has earned a well-deserved 2013 Best Value for Money Award!